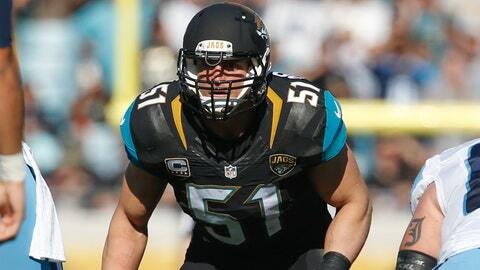 Paul Posluszny started all 16 games for the Jaguars last season and finished with 133 tackles. JACKSONVILLE, Fla. (AP) — Jacksonville Jaguars linebacker Paul Posluszny is switching positions for the first time in his NFL career, and he doesn’t seem totally comfortable with the decision. Posluszny said Tuesday that new coach Doug Marrone is moving him from middle linebacker — the spot he’s played since peewee football — to strong-side linebacker. It’s a tricky transition that will require Posluszny, who is entering his 11th season, to play near the line of scrimmage and in coverage more often. And instead of playing every down, he is likely to have a lesser workload in which he’s only on the field in base formations (first and second downs) as well as short-yardage and goal-line situations. “It’s going to be the biggest challenge of my career,” Posluszny said. Although it might seem like a minor tweak, it’s more like a major overhaul for someone who walks, talks, looks and acts like a prototypical middle linebacker. This could end up being an identity crisis for the former Penn State standout. After all, it’s all he’s ever done on the football field, all he’s ever known aside from a three-year stretch in college during which he played weak-side linebacker. The Jaguars want to get second-year linebacker Myles Jack, a second-round draft pick in 2016, on the field and more involved. Jack played sparingly as a rookie, but his speed and athleticism are expected to be an upgrade over the 32-year-old Posluszny, assuming the former UCLA standout can pick up his new role during the offseason, in training camp and in the preseason. Posluszny started every game last season, finishing with 133 tackles and 1 sack. He’s averaged more than 100 tackles during his decade in the league, rarely being out of position but criticized for not making enough game-changing plays. He has 14 sacks and 15 interceptions. Although Posluszny was clearly uneasy about the move, he took the high road and said the right things. “More important than anything, I just want to win,” said Posluszny, who is 46-114 as a pro in Buffalo and Jacksonville. “So if they say this is what’s going to be best for the team to win, then let’s do it. Yeah, it will be a new challenge. It’ll be exciting to learn a new position, learn some different techniques, do things on the field that I’ve never had to do before. But he also took the move as a slight.